Burlington Stores' operating margin rose again in the second quarter as the company's efforts to improve inventory management and downsize to smaller stores continue to pay off. TJX Companies (NYSE:TJX) and Ross Stores (NASDAQ:ROST) have achieved enormous success through their off-price merchandise strategies over the past few decades. Both retailers have grown rapidly and consistently earn double-digit operating margins. By contrast, Burlington Stores (NYSE:BURL) has historically been a much less successful off-price retailer. While it is similar to TJX and Ross Stores in many ways, the low sales productivity of its stores has caused it to lag far behind its off-price rivals in terms of profitability. However, Burlington has been steadily improving its profit margin in recent years, driving rapid earnings-per-share growth. Last week, the company reported that this trend continued in the second quarter. Burlington Stores posted a 2.9% comparable-store sales gain last quarter. This was near the high end of the company's guidance, but it lagged Ross Stores' 5% comp sales increase and TJX's even stronger 6% comp growth. Burlington's total sales rose 9.9% year over year. However, margin expansion was the real standout, as has often been the case for Burlington recently. Gross margin increased by 0.7 percentage points to 41.4%, while operating expenses declined slightly as a percentage of revenue. Burlington's profit margin expanded again last quarter. Image source: Burlington Stores. As a result, Burlington's adjusted operating profit reached $105 million: up 24% year over year. This gave the company a 7% operating margin. Adjusted EPS surged 51% to $1.09, smashing the company's forecast of $0.91 to $0.95, as well as the average analyst estimate of $0.96. This EPS growth rate was actually slightly slower than Burlington's 59% adjusted EPS increase for the first quarter of fiscal 2018. Like TJX and Ross, Burlington Stores tends to provide conservative earnings forecasts -- and it routinely beats them by a wide margin. Back in March, management projected that adjusted EPS would reach a range of $5.73 to $5.83 in fiscal 2018, up from $4.37 a year earlier. (Some of the increase relates to the reduction of the federal corporate tax rate.) In May, following a strong first quarter, the company raised its full-year EPS forecast range to $5.90 to $6.00. Burlington raised its full-year EPS guidance again last week. It now expects to earn between $6.13 and $6.20 per share. Comp sales growth is expected to come in between 2.9% and 3.4% for the full year. The updated guidance implies that Burlington's operating margin would be roughly flat year over year in the second half of fiscal 2018, after rising by 0.8 percentage points in the first half of the year. This suggests that the full-year forecast is still pretty conservative. Over the past few years, Burlington Stores has dramatically improved its inventory management, driving steady margin expansion. It has also started to focus on shrinking the average size of its stores while improving the quality of its real estate -- thereby boosting sales per square foot. Nevertheless, there's plenty of room for improvement. Burlington's operating margin and sales per square foot remain well below what TJX and Ross Stores routinely produce. 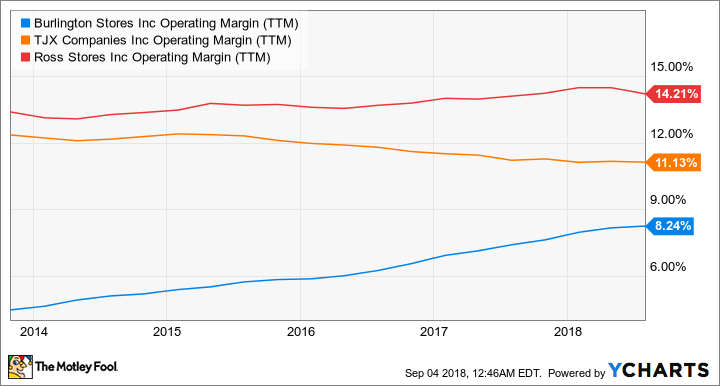 Burlington Stores Operating Margin (TTM), data by YCharts. TTM = trailing 12 months. On the other hand, Burlington Stores stock trades for 27 times the company's projected 2018 earnings, having nearly doubled over the past year to a new all-time high. This valuation represents a meaningful premium over TJX and Ross Stores shares. In other words, investors are already pricing in quite a bit of additional margin expansion. Burlington Stores shares still have plenty of upside if the focus on better inventory management and smaller stores allows the company to boost its operating margin into double-digit territory. However, Burlington's valuation could collapse if earnings growth slows. Thus, the stock is only appropriate for investors with a fairly high risk tolerance.